The Face Shop Teams Up With Coca Cola And We Absolutely Adore It. Here’s Why. The Face Shop has up their game yet again this time by collaborating with one of our favourite childhood brands, Coca Cola! Now, we all know that consumption of fizzy drinks is not the most brilliant move for our health but this collaboration between The Face Shop and Coca-Cola is just a stroke of genius! 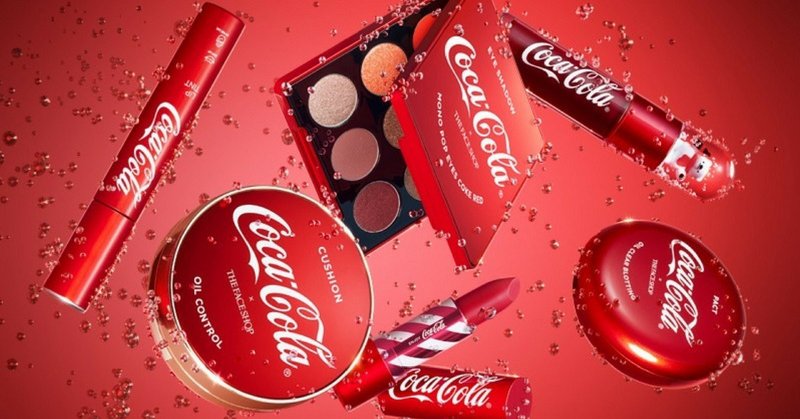 Some may agree that Cola Cola’s packaging somehow reminds us about the good old 1960s retro style and adding it onto a makeup collection makes it so eye popping that we’re contemplating spending all our money just to get one of these babies! Their bear lip tint caught our attention as it isn’t just any normal cola looking but, there is a small cute white bear holding a tiny coke bottle. How cute! Previously, The Face Shop also collaborated with Marvel. If you have never seen or heard about it, here’s a picture of The Face Shop x Marvel Collection. True enough, the Marvel collection drove all Marvel fans crazy. The Face Shop really know what they are doing and can’t stop catching our attention with amazing collaborations. We can’t wait to see the next collaboration already! Let us know down below what you think about The Face Shop x Coca-Cola collaboration. Which item has made it to your MUST BUY list already?